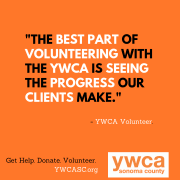 Purpose: To build awareness of the mission of YWCA and to promote the YWCA brand. Please note: specific tasks may change depending on event. This volunteer opportunity is on an as-needed basis. We will reach out to you as and when events occur, typically a month beforehand.